If you owe money to the IRS and can't pay, you may be eligible to defer making payments on past-due income taxes. To qualify for deferral, you need to have little or no money left over every month after paying essential living expenses such as rent, utilities, and groceries. The IRS will place your account in the "Currently Not Collectible" status and will hold off on collecting past due taxes, they won't garnish wages or levy bank accounts, and they won't request that you set up an installment agreement. Deferring tax payments sounds great, especially if you have been struggling to make ends meet. Currently Not Collectible status can provide much needed breathing room—time that you can use to get back on your feet and figure out a way to pay off the IRS without the immediate threat of collections activity. But consider the downsides as well. 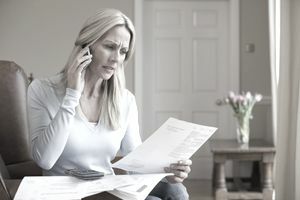 The tax debt does not go away: you still owe the past-due tax, and the balance continues to accumulate interest and late penalties. The IRS will also hold onto any future tax refunds (called a "refund offset") and apply them to the outstanding balance due. The IRS may also file a Notice of Federal Tax Lien against your property which shows up on credit reports and puts creditors on notice that you owe an outstanding balance to the IRS. When Is Currently Not Collectible a Good Option to Pursue? Tax practitioners can evaluate whether you are a candidate for Currently Not Collectible status as well as consider other options for dealing with outstanding tax debts. They will take a comprehensive view and calculate the monthly payments on an installment agreement, the settlement amount on an offer-in-compromise, and eligibility for Currently Not Collectible status. All three options use roughly the same financial data. You only have a few more years left on the 10-year statute of limitations. You make less than $84,000 per year, your living expenses fall within the IRS's guidelines, and your have little or no money left over after paying for basic living expenses. Your only income is from Social Security benefits, welfare benefits, or unemployment benefits. You are unemployed and have no other source of income. How Long Does Currently Not Collectible Status Last? The amount of time you remain in Currently Not Collectible status is directly related to how much income you earn and how quickly your income situation improves. When the IRS approves someone for Currently Not Collectible status, the agent inputs a closing code on the taxpayer's account that tells the IRS when to pull the person's file for review. Ask the IRS what closing code they use when setting up the noncollectible status so you will know what income level will trigger follow-up from the IRS. Let's say Bob is 65 and has an eight-year-old tax debt. He makes $30,000 a year. After taxes are withheld from his wages, he has just enough money to pay for rent, utilities, groceries, and his monthly bus pass. Some months he has a little bit left over, and other months he just gets by. The IRS reviews his financial situation and determines that he qualifies for Currently Not Collectible status. The agent working the case puts in a closing code for $36,000. The IRS will follow up with Bob to see if he can afford to start making monthly payments after the first tax return Bob files showing total positive income of $36,000 or more. Review the level of withholding (on wages, pensions, etc.) to make sure it's sufficient so that there will be zero balance due when the next tax return is filed. Review the level of estimated taxes (on self-employment, farming, or business income). Are the estimated payments sufficient to avoid owing when the next tax return is filed? The IRS wants to make sure the person won't be incurring any new tax debts. It's the number-one rule to getting out of debt with the IRS: "no new tax debt." Are all tax returns filed? The IRS wants to make sure all tax returns are filed. If there are any unfiled tax returns, the IRS wants to know if those returns will have any balance due, or if there are refunds. Step 2. Fill Out the Financial Statement. Complete either Form 433-A, Collection Information Statement for Wage Earners and Self-Employed Individuals, or Form 433-F, Collection Information Statement. Both forms ask for similar types of financial data. Pick one and work through it from top to bottom. If you plan to hire a tax professional to help, fill out one of these forms and bring it, along with three months of bank statements, to your first meeting. Make a list of everything you own (bank accounts, investment accounts, retirement accounts, cars, trucks, motorcycles, boat, property, life insurance, and so forth). Estimate market value for those assets. Track how much income you made in the last three months. Track spending for the last three months. Report a three-month average of income and expenses by category. Step 3: Analyze the Financial Statement. For details in how the IRS analyzes financial statements, refer to Financial Analysis Handbook in their Internal Revenue Manual (5.15.1). Calculate monthly income, necessary living expenses, and what's left over each month after paying basic living expenses. This is the amount of money that you could potentially spend on tax payments to the IRS. Next, compare monthly living expenses to the IRS' allowable expenses. Suppose Jan, a single person with no dependents, pays $6,000 a month in rent. But the IRS knows it typically costs about $2,000 to rent a one-bedroom apartment in the city where Jan lives. The IRS will only allow $2,000 in rent expenses. To work with these collection financial standards, set up a spreadsheet or work paper with four columns. In one column, write down all the categories of expenses as shown on Forms 433-A or 433-F. In the second column, write down your actual expenses in each category. In the third column, write down the relevant collection financial standard for each category of expense. In the fourth column, write down the lower number from column two and column three. The IRS will take whichever number is lower as the allowed expense for that category. Here's another way to analyze the numbers. Are any of your actual expenses significantly larger than the relevant collection financial standard? If so, the IRS will disallow any expenses above the collection financial standard unless you can demonstrate that the additional expense is necessary for you and your family's "health, welfare and/or production of income" (see Internal Revenue Manual 5.15.1.7). The IRS will also expect you to provide proof of payment so they can verify the expense amounts. Finally, calculate net disposable income by taking total monthly income minus allowable living expenses. Subtract all allowable expenses from total monthly income to calculate what the IRS expects you to pay toward unpaid tax debts. If you have $100 left over after paying necessary living expenses, the IRS will expect you to set up an installment agreement to pay $100 a month. If monthly income is equal to or less than the necessary living expenses, then the IRS considers that a hardship situation (Internal Revenue Manual 5.16.1.2.9) and can place your account into Currently Not Collectible status. Step 4: Submit the Financial Statement to the IRS for Review. If you think that you might qualify for Currently Not Collectible status, submit your paperwork to the IRS and ask them to determine if your account can be placed in Currently Not Collectible status. Note the time and date of your call, the badge number of the IRS agent you spoke to, what was discussed, and the outcome of the call, such as the IRS's decision or any follow-up items. If you don't qualify for Currently Not Collectible status, you can still ask the IRS for an installment agreement based on your ability to pay. It is a good backup plan, so be prepared to discuss whether that is doable for you. Policy Statements for Collecting Process Activities (Internal Revenue Manual 1.2.14), especially Policy Statement 5-71.